The artist will give a brief introduction to her installation at approximately 8 pm. Crossing the ocean for my first visit to America, I am preoccupied with my ideas about Atlanta. I have heard about the city and visited it by internet and talked with some people about the social structures there. My preparations for Eyedrum deal with the perhaps unrealistic idea I have about Atlanta. Let's say that I developed a sound for Atlanta in which I will give Atlanta a song which I dreamed in Holland. This "dream song for Atlanta� will be mixed with the audio-explorations I will do there. At Eyedrum I will make a multi-media installation in situ, developing a "cross-fade" situation in which real sounds are mixed with virtual and ambient sounds. The whole audio piece is based on ideas about "cross-fade perception." It is my belief that we can perceive many different pieces of information at the same moment. But it asks effort of the perceiver to concentrate simultaneously on "wide" and "narrow" perception. It is a kind of "brain-gymnastics." It is also my belief that when we succeed in "cross-fade perception" we experience the world more openly and develop our humanity. It makes us experience our life intensively and as a whole. 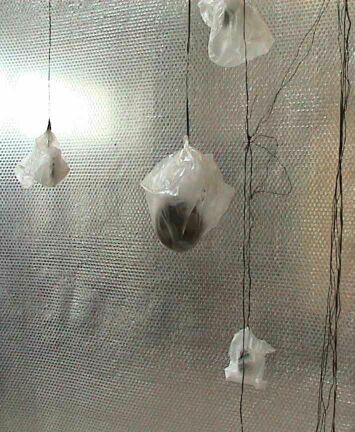 In the Eyedrum space will be built a work which includes a large number of small audio speakers, a sound-generating, hanging and turning object, and contact microphones. All over the space you will hear sounds, creating an "audio wave." The "dream song for Atlanta" will be mixed with interviews with Atlanta inhabitants and sounds recorded in the city. The interviews will deal with the dreams, wishes and expectations people have about their lives and the place they live, and more specifically the social context in which they live. The recorded sounds from the city are the context in which the several layers of life (the dream song and the interviews) are mixed at the Eyedrum space. Another part of the audio is a text I have written which is inspired by the people I have met here and some of the music in Atlanta. The text is performed by MC Wyzsztyk of the Atlanta hip-hop group Psyche Origami. The installation also contains some objects which I made here, inspired by my visits to people�s homes and to the city. Domestic and urban situations as parts of the whole, they can't exist without each other. The new artists' book "Situations" will be presented at the opening. The book is a visual and textual entity which covers a region of research and experiences. Several authors took part in the project. Their texts are combined with photos of multi-media installations, objects, video-stills, paintings and drawings. JUUL SAD�E is an installation artist working with sculpture, sound, and video. She works in Maastricht, the Netherlands, and Tongeres, Belgium. She has exhibited throughout the Netherlands, Belgium and Europe, and recently in Tokyo. A Song for Atlanta is her first exhibition in the United States.